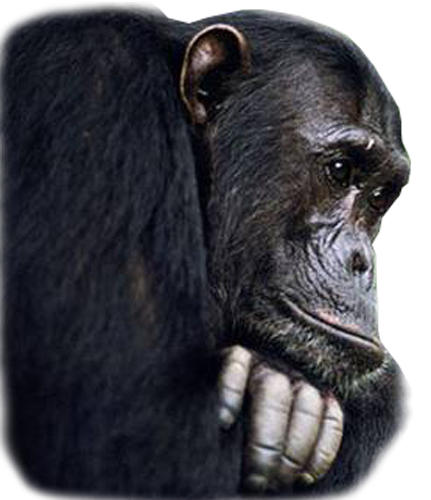 Apes are among the most intelligent animals on the planet and the closest living relatives to our species. They first appeared in Africa during the Early Miocene 23 – 16 million years ago (mya). The regions of Ethiopia, Kenya, Uganda, and Nambia are littered with the earliest of their remains. The drastic climatic distribution of dry and wet seasons and geographical partitions that dominate east Africa today had not yet taken place and the landscape was probably a mixture of forests and moist woodlands (Stanford, et al.). Environmental changes were drying the landscape, transforming it into open-vegetated woodlands and grasslands. Evidence of land connection between Eurasia and Africa first appeared approximately 17 mya allowing early apes their first opportunity to emigrate from Africa. By 11mya apes were well established throughout Eurasia. The living apes are divided into two families based mainly on body size: The Hylobatidae or lesser apes (gibbons and siamangs) and the Pongidae or great apes (orangutans, gorillas, and chimpanzees). Gibbons, siamangs, and orangutans inhabit rainforests throughout Southeast and southern Asia. Gorillas and chimpanzees live in various rainforest ecosystems within equatorial Africa. The apes are highly k-selected animals, investing a significant amount of time and energy in rearing their offspring. It is only in our pongid “cousins” have we seen simple human tool technologies, language acquisition and cognitive development paralleling that of children, forced copulations, and lethal warfare amongst competing tribes (Stanford, et al.). The apes share a number of anatomical traits. Their postcrania are well adapted for increased suspensory activities such as arm hanging and brachiating. Apes are broad-chested with posteriorly attaching shoulder girdles, allowing for an increased range of motion. 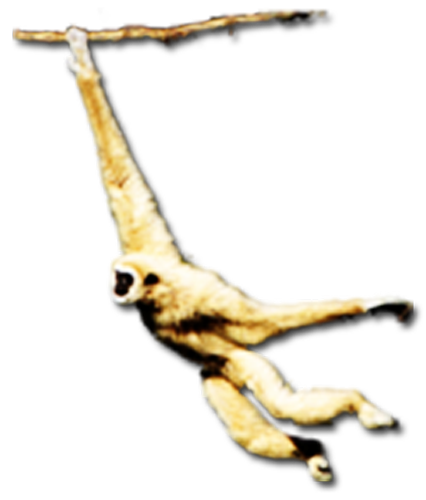 According to Stanford, et al., “Arm hanging could have been adaptive to suspending a large primate under a tree limb from which ripe fruit was growing. 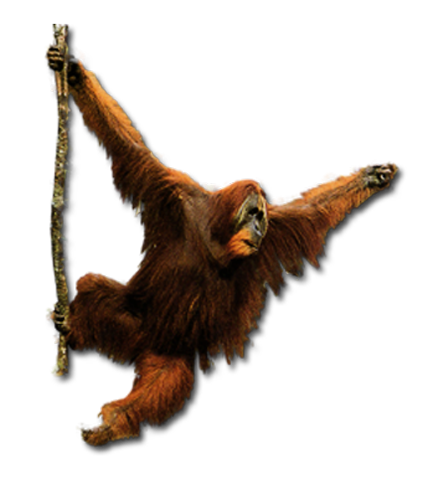 The limb could not support the primate from above but could easily support its weight from beneath.” Short broad pelvis’, short spinal columns, grasping hands and feet, robust jaws, flattened faces with downward facing nostrils, and a lack of a tail are ape signature characters (Burnie and Wilson). Apes have developed various forms of social groupings each expressing a complexity of social interactions. Gibbons and siamangs form relatively monogamous pair bonds. They mate typically for life and defend their territories through an extremely diverse and complex series of songs. Orangutans are highly solitary. Mothers and dependant offspring can be seen together as can sisters. Only when food is in abundance will orangutans be seen in multiple numbers feeding in the same area. Fully sexually reproductive males are completely intolerant of one another. 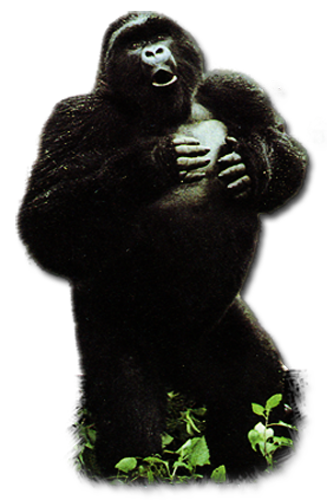 Gorillas live in troops of about 5 – 10 individuals usually led by the adult male silverback. Chimpanzees form communities of 40 – 100 members. The community is comprised of numerous coalitions of males, females, and male-females under the rule of the alpha male.